Even though it’s 70 degrees F outside, I’m currently making chili. Ha! It sounded good so I thought why not? When I got home from work today Benzo said “guess what – we have potatoes.” If you remember, I planted potatoes almost three weeks ago. 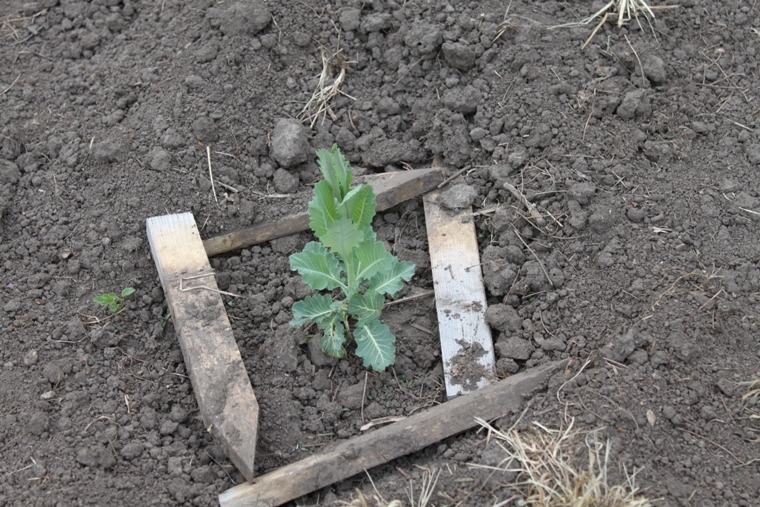 Almost every day I would go out and check the plot and never saw any sprouts. 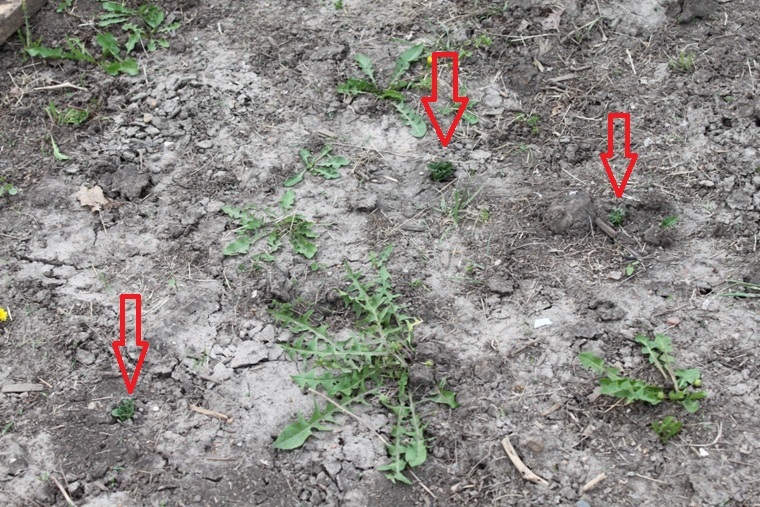 As days passed I stopped weeding the potato plot because I was afraid something that I thought was a weed was actually a potato. I’ve never planted potatoes before so I have no idea what the plants look like. So I was skeptical when Benzo said “we have potatoes.” By now I was convinced that the seed potatoes had rotted in the ground and we weren’t going to get anything. So after I changed clothes and got the chili started, we trooped on out to the garden. Sure enough there was a new dark green plant popping up that I hadn’t seen before. How did we know it was a potato and now a weed? Well I suppose I don’t know for sure until I actually pull a potato out of the ground. But this plant doesn’t look like any weed I’ve seen before in the garden. 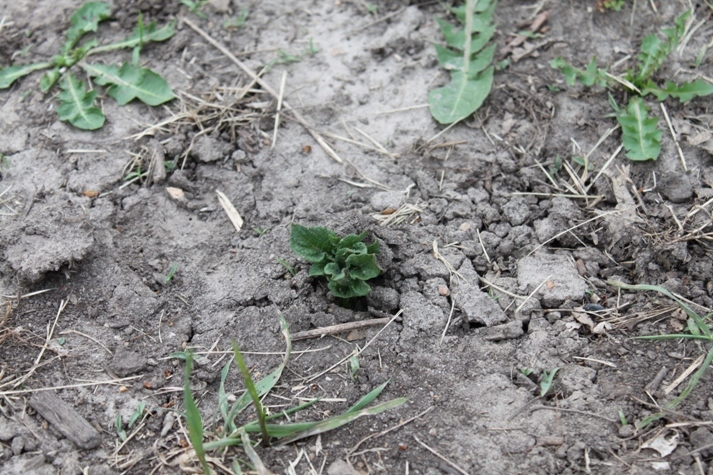 And more of them are sprouting up approximately one foot away from each other, which is how we planted the seed potatoes. It’s kind of hard to see in the larger picture, but there are three here sprouting up. And there were more elsewhere in the garden. In other good garden news, I’m pretty sure now that the plant Benzo rescued from the compost is kale. Benzo planted it in the dirt and it actually rooted! I’ve planted other kale from seed but this guy is way ahead of the game. 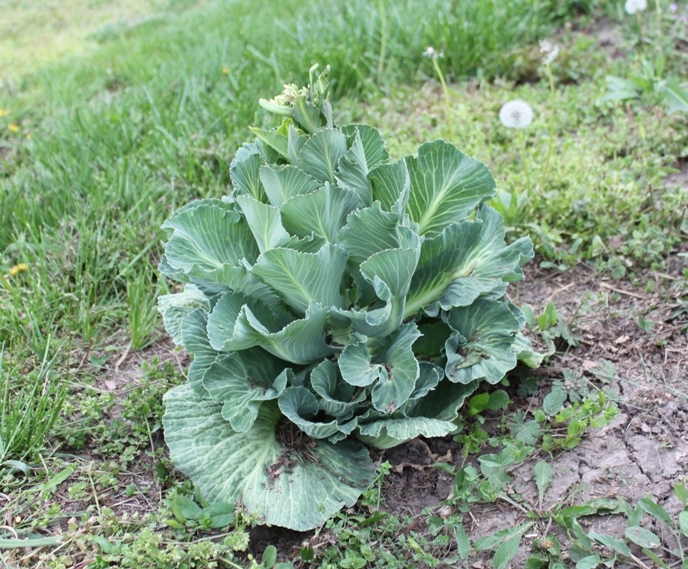 In other sad garden news the cabbage that survived the winter has bolted. 😦 No early head of cabbage for us. 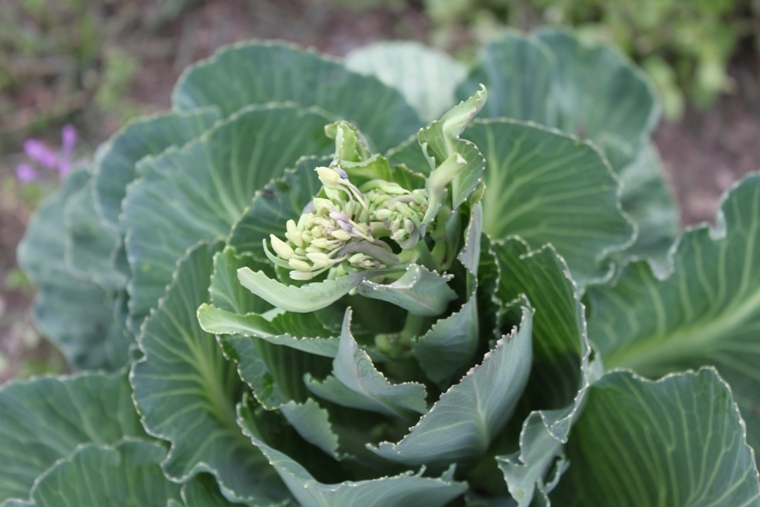 “Bolted” means that the cabbage plant formed a seed stalk instead of a head. A long stem grew out of the center of the plant and at the end the flowers popped out. Once a plant bolts, its life is over. There’s nothing you can do to save it now. I’ll have to pull it up and toss it in the compost. Sad! I might just let it go for a couple of weeks to see what it does. Cabbage in the wild! P.S. The chili was awesome! Congrats on the potato babies!